This spring, Dr. Annie Wishna attended her ten-year medical school reunion at Washington University in St. Louis. Dr. Wishna had the opportunity to not only catch up with old friends, but also to learn about some of the latest and most innovative breakthroughs in medicine. 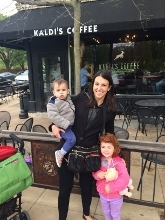 For Dr. Wishna, a visit to St. Louis would not be complete with out a visit to Kaldi's Coffee for one of their chocolate chip cookies. Her kids, Vivien and Abe, agreed that the cookies were delicious.